Kellogg Community College’s women’s volleyball team went 3-1 at the Gerald R. Ford Fieldhouse this past weekend as part of the Grand Rapids Community College Raider Challenge invitational, lifting their overall record for the season so far to 15-4; the team’s conference record is 7-3. See scores from each of this weekend’s matches below. On Saturday, Sept. 30, KCC fell to Oakland in four sets. Oakland took set two 25-18, set three 25-22 and set four 27-25; KCC took set one 25-23. Also on Saturday, Sept. 30, KCC defeated the JV squad from Calvin College in five sets. KCC took set one 25-22, set four 25-19 and set five 15-11; Calvin took set two 25-23 and set three 25-20. On Sunday, Oct. 1, KCC defeated Mott in three sets, taking set one 25-19, set two 26-24 and set three 25-17. Also on Sunday, Oct. 1, KCC defeated Macomb in three sets, taking set one 25-19, set two 25-12 and set three 25-19. KCC’s next match begins at 6:30 p.m. tonight, Tuesday, Oct. 3, against conference opponent Lansing Community College in Lansing. 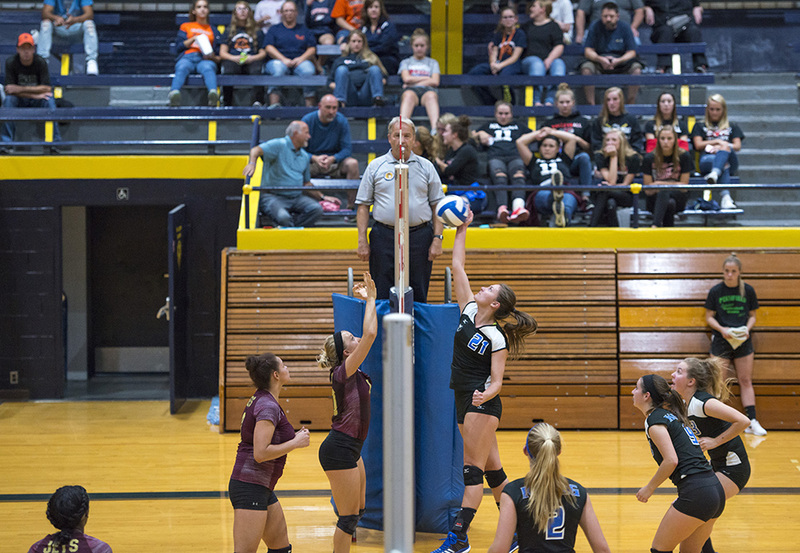 The Bruins previously defeated LCC in three sets at home in Battle Creek on Aug. 31. The Bruins’ next home match — the final home match of the season — begins at 6:30 p.m. Thursday, Oct. 5, at the Battle Creek Central Fieldhouse, 162 Champion St., Battle Creek, against conference opponent Kalamazoo Valley Community College. For more information about KCC’s women’s volleyball team, including a full season schedule, roster, results and photos of the team, visit www.kellogg.edu/volleyball.